Who knows why the faithful might be attracted to a certain saint? Like so many things in life it is a matter of taste, interest, and in the case of saints where your prayer-life may lead you. I’m not sure if I saw an image of her on a prayer card in a Catholic bookstore, or if I purposefully went looking for another Irish saint besides the most notable one (Patrick). Whichever if happened to be, I was a new Catholic about ten years ago coming from the Protestant tradition with its empty crosses and barren walls, and I found the idea of saints very comfortable and appealing. As this series has shown, one can soon be overwhelmed with all of the saints in antiquity. How can you learn enough about them to be a good Catholic? Is it something I should be striving to do? Perhaps the best thing is to find a few who you feel the Holy Spirit is moving you towards, and ask them to help you with your prayers. So that is what I try to do. 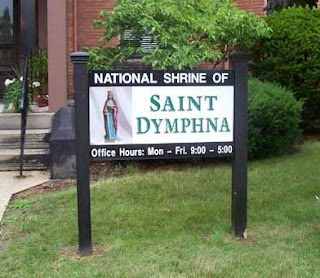 I was just re-reading Dymphna’s story in some of my literature sent to me by Father Gretchko at the National Shrine of St. Dymphna in Massillon, Ohio. A while back I found them on the internet and filled out something online which amounted to my receiving an envelope full of stuff. I was moved to send them $25, and a few weeks later received more stuff along with a “Perpetual Membership” (see picture below). I looked over his price list and noticed that a perpetual membership for one person costs $25, so although I did not specify anything this is what I received. I am quite pleased. Dymphna’s story comes from the seventh century in Ireland, which makes it little more than a part of legend and faith. Her father was a pagan king, and her mother was a Christian and very beautiful. Her mother dies suddenly and her father goes crazy. He sends people to several countries trying to find him another wife to match the beauty of Dymphna’s deceased mother, but they are unable to. He decides the only woman who can replace his wife is his own daughter. Now comes my favorite part of the story, and I’m not sure why but I suppose because one particular detail always makes me smile. Wherever you read the story it always states that Dymphna fled Ireland with her personal priest, Father Gerebran, the court jester and his wife. I’m not sure if the “wife” mentioned is married to the court jester, or to Fr. Gerebran, but what I find funny is the specificity of mentioning the court jester. As far as I can tell there is no rhyme or reason he went with them, but he did and he is always mentioned. I suppose it is a more lofty mention than simply “wife”. We already have two unnamed wives in the legend; the wife who flees with the group, and the initial wife of the king (Dymphna’s mother). This unlikely foursome ends up in Gheel, Belgium. It seems like a very hard trip for the seventh century: crossing the Irish Sea, across Wales and England, then crossing the North Sea to the continent! The king follows them and orders Fr. Gerebran killed, and after she rejects him again he kills his daughter Dymphna. I don’t know what happened to the court jester and his wife (if she was indeed the wife of the court jester). The people of Gheel buried the two who were martyred, years later went to re-bury them more properly, and this is the catalyst for which miracles and cures began to occur in the area. A church is built on the site, and later an institution named the “Infirmary of St. Elizabeth” which gave care to patients from that point on who were insane or afflicted with other mental disorders. The care given was very much before its time, with the idea being that the people cared for would end up again as productive members of society. Is it because of her father’s mental state when he killed her that Dymphna became a patron for people with mental issues? I suppose so. And so St. Dymphna is remembered, novenas are said in her name, daily prayers are recited to her mostly with special attention given to those who might suffer from some sort of mental disorder. If Janet posts this piece on Week 19, not only will it be Pentecost Sunday but it will also be May 15th, the day Dymphna was martyred and her feast day in the Catholic Church. As my little booklet from the National Shrine reads, Thus the glorious crown of martyrdom was accorded to St. Dymphna in the fifteenth year of her age, on the fifteenth day of May, between 620 and 640. The day of her death has been assigned as her feastday. It is amazing to me that such a small story, so obscure as to be little more than a legend, could end up having such an enormous impact on so many people. This is of course a testament to the faithful; the Body of Christ. The Holy Spirit brings St. Dymphna to me in particular because of people in my family that need her intervention, both alive and passed away. So I do my best to lift them up in prayer to her, with faith that my prayers will be answered. Stuart Moore is a Catholic who is doing the best that he can. In this series, he has written about El Santo Nino de Atocha. 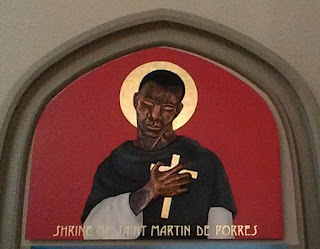 This is (another) saint of whom I'd never heard, and an Irish one too! Thanks very much. This is a great post. I was aware of St. Dymphna and indeed prayed a novena to her once regarding a particular situation (which turned out well, or at least not the disaster I had feared). So I think of her with fondness. Somehow I missed the bit about the jester, though! The court jester is quite integral to her story, Mac! If a fictional account were written of the trip from Ireland to Belgium I have a feeling he would be the favorite character. Thanks, Stu. She is one of a litany of saints that I pray to because we need her--probably every family does--but I never knew her story. I had no idea she was in Belgium.